Each and every morning when I arrive at Stone Ledge, Samson, Delilah, Max, Cry Baby, Prudence, and Phantom greet me with meows, head butting and tails held high like little flags as they announce themselves with all the pride and confidence of olympic athletes at the opening ceremonies. It is only Midnight who comes alone, slipping unnoticed through the underbrush. I usually hear her softly call to me before she steps into view. Midnight does not live with the other cats, but chooses to stay in unknown quarters in the hills beyond Stone Ledge. She does not eat with the colony either. Her bowl is under a forsythia bush at the far side of the woods. There is a large rock next to the bush that she sits on while she waits for me to feed the other cats. She does not, however, let me forget that she is patiently waiting, as she talks to me in a sweet yet persistant series of meows while I pour water and pop cans for the larger brood. Midnight is petite with small, delicate paws and an angular face. 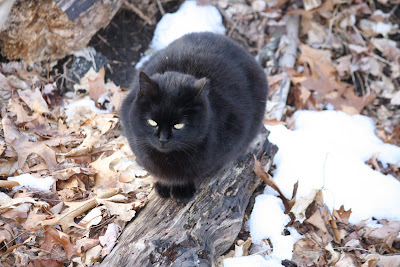 She is black with green eyes, but in the sunlight streaks of dark mahogany are visible in her fur. Midnight is not much larger than a six month old kitten, yet she has birthed at least one litter--if not more. Jo trapped Midnight with two of her kittens (the only two we were ever aware of) at Stone Ledge. * Then while trying to move Midnight into a separate cage prior to having her spayed, Jo was badly bitten, and Midnight, who had not yet had a rabies vaccine, had to remain in quarantine for over two weeks before the vet felt comfortable in saying that Jo was out-of-the-woods and could release her. During this time, Midnight was miserable and it was obvious that, while her kittens could be socialized, she was a dyed-in-the-fur feral. Jo released Midnight at Stone Ledge where she has maintained her solitary life-style (if a cat can be said to have a "life-style") ever since. I often wonder if she has somehow been hard-wired to remain in the place where she last saw her kittens....I doubt that I will ever know the answer. *Jo kept Midnight's kittens who are doing splendidly.